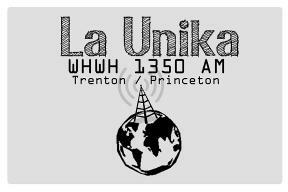 WHWH La Unika 1350 AM is the only 24/7 Spanish radio station to serve the Trenton / Princeton area. La Unika 1350 AM is the only Hispanic radio station in the Trenton / Princeton area. With 5000 watts makes it a powerful way to reach the ever increasing Spanish marketing in the area. An estimated 400,000 Latinos living in the Trenton / Princeton area, La Unika 1350 AM is a great way to expand your business with the Latino market in that area.